The ice-filled summit crater of volcan Sollipulli, Chile. A fascinating story has emerged this week from a paper in Nature Geoscience by Amanda Lough and co-workers (Lough et al., 2013), on the discovery of a new volcano deep beneath the ice of the Western Antarctic Ice Sheet (WAIS). The discovery is partly a story of scientists looking in a place where no-one had looked before; this case, using a network of seismometers, as a part of POLENET/ANET – a polar earth observing network. The instruments were laid out across a section of Western Antarctica, which is known to contain some large and relatively young volcanoes. The surprise from the data was the discovery of a deep source of seismic activity (earthquakes), in a location that didn’t match any of the existing volcanoes. The authors were able to show that the earthquake signals look like those from volcanoes, and not like those made from breaking rock or creaking ice; and they were also clustered into small swarms, both in time and space. All of this evidence points to the idea that these earthquakes relate to the movement of magma deep in the crust beneath a small volcano that was not previously known, and which hasn’t yet emerged above the ice. This is fascinating ‘discovery’ science, and poses all sorts of interesting questions about how and why the volcanoes in this part of Antarctica exist in the first place – a topic where little is known, but where there is a very timely recent paper by Wesley LeMasurier. Of course, much of the press coverage has focussed on speculation about whether, or not, there might be calamitious effects for the West Antarctic Ice sheet in the case of an eruption (The short answer is no!). One broader reason for my interest in the paper is that it links to the long-standing question of what happens when large volumes of ice are removed from volcanoes? On Earth, the main example of this relates to the end of the last glaciation, which began between about 18,000 and 20,000 years ago. The current hypothesis, which has been around for some time, goes like this. 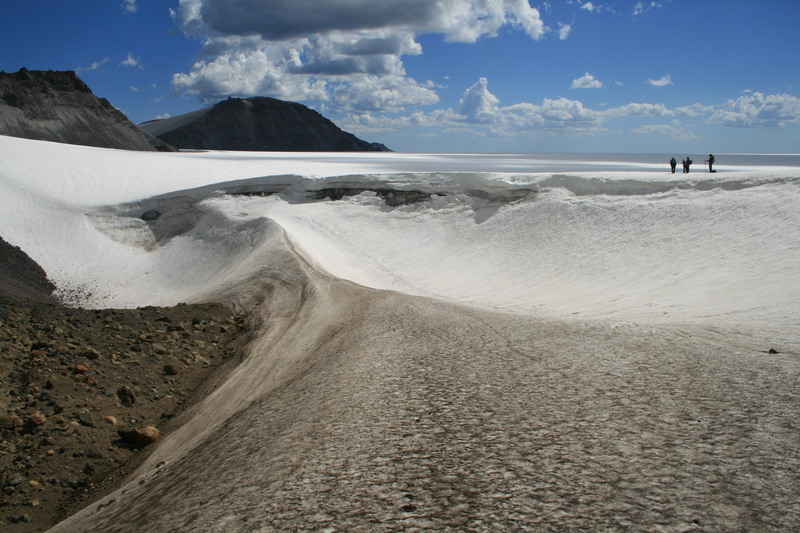 During the peak of glaciation, vast areas of the land surface can be buried under great thicknesses of ice – perhaps as much as hundreds of metres to kilometres. Then, during deglaciation, the ice retreats rapidly reducing the pressure on the rocks beneath. So far so good, but how could taking away some ice have any effect on volcanoes? One clue to the answer may come from Iceland. This is a part of the world where the mantle is hot enough at shallow enough depths, that there is a column of partially-molten rock that probably extends from about 40 km depth down to about 100 km depth. Here, where the rock is above its melting point, Charlie Langmuir and Dan McKenzie have shown that that amount of melt increases by about 1% for a pressure drop of 100 MPa. So removal of a 1000 m thick column of ice (at an Icelandic volcano) will translate into a pressure drop of 10 MPa, and an increase of melt fraction of 0.1% along the length of the 60 km melt column. This is to a change in the amount of melt produced of 60 m. This might not seem like much – but when you consider the full size of the melting region in the mantle, this could correspond to a considerable volume of melt produced simply as a result of ice removal. In Iceland, there is geological evidence for a pulse of eruptive volcanism that occurred very shortly after deglaciation – around 11,000 years ago. Moving back to Antarctica, the current idea is that the volcanoes beneath West Antarctica might also be fed from a plume, similar to that beneath Iceland and the Canary islands. So perhaps it is plausible that a similar explanation might also apply in Antarctica, and there might be a feedback on geological timescales between large-scale mass changes in the ice sheet, and the magma supply from depth? What is not clear, yet, is whether this same mechanism applies to the volcanoes that form above subduction zones. Here the melting process is a little different, driven primarily by the arrival of water into the mantle. So it is not clear how pressure changes due to changing ice load might lead to changes in melt production deeper down. It is also not yet clear, from the geological evidence, whether or not there were changes in rates of eruptions at the subduction zone volcanoes that were once covered with ice. This remains a work in progress!